I was really drained after all the heartaches of Wednesday. I finally went back to my parents in the evening to take our doggy for a walk, trying desperately not to get into any more horrible arguments. I really tried. Sadly Mum was still on the attack. She started off trying to make peace which was fine. 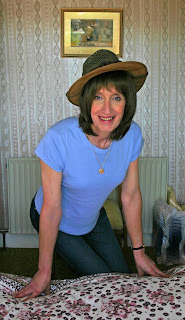 When she reiterated she still regarded transsexuals as men, I just had to walk away. Dad sat smugly grinning waiting to throw in his usual ill-informed comments about my transition. I had to get out fast. There were just too many emotions for a rational discussion. I grabbed a sleeping bag & my pillow & left, only to come back twice more for my handbag & more importantly all my tablets. Taking the tablets back to my home was the scary bit. It was only late last April after the Lucy teenage TS documentary led to some nightmarish comments from my parents, that my best friend’s chance intervention saved my life. After that I decided to take all tablets & sharp instruments out of my flat because of my suicidal thoughts. I had been suffering deep depression & nightmares before those dreadful thoughts & had stayed at my parents for 3 years to avoid being alone. I had shown thankfully I am much stronger now. I can promise all my dear friends & family I have too much to live for now. I returned to my flat & pulled the phone connection out so I could not be contacted by my parents. This went on for about an hour until I realised that was just too selfish. I did not want any of you, including my parents, to be concerned for me & think that I had done something silly. Within a few minutes my Mum was on the phone crying her eyes out pleading with me to come home. I wanted none of this to happen. All I wanted was a little respect & understanding. Our dear little corgi was caught up in it all & had not eaten all day. It was heart breaking for all of us. My devotion to my family got the better of me & I agreed to come back. Common sense was telling me this time I needed to break free but I failed. I love them so much. When I got home Mum & I hugged & made up. I am ashamed to say I wanted nothing to do with my dear father. His stubborn ignorance was behind most of what Mum was saying. Mum & the dog just wanted me back. We talked for a while. I explained that they really needed to see what they were doing to my health & that they had actually put me in hospital today. It was a bit mellow dramatic to say that but it was true. They were breaking my spirit. I told them I need to transition & that I cannot have them stopping it from happening. I need to get on & change my name & had waited long enough for them. Out of the blue my Mum agreed with me & suggested I book it for next week & that she would still like to come with me. At last! We agreed on Wednesday or Thursday next week. So Thursday morning I was on the phone to the solicitors. Debbies day is finally booked. I am pleased to announce that on Wednesday 14th May 2008 I will legally become Debbie. So I am finally getting there. I thought I would be euphoric but at the moment I feel numb & slightly scared. The pain of all the emotions we are going though is not doing any of us any good. I received some excellent advice from my dear friend Kate. She suggested “personally I wouldn't try to argue with your parents. Words aren't going to change anything. Like you I'd thought meeting your counselor might help: after what you have described I doubt it. I think the way to win your parents round is just to be Debbie and be happy. What in Christian evangelical circles would be called living witness. Just demonstrating the truth of what you want to say by visibly living it for them to see”.